On December 24, the Senate passed a vote by a razor thin margin (with not a vote to spare) to raise the Federal debt ceiling from $12,104 billion to $12,394 billion. The actual debt ceiling increase took effect on December 28. 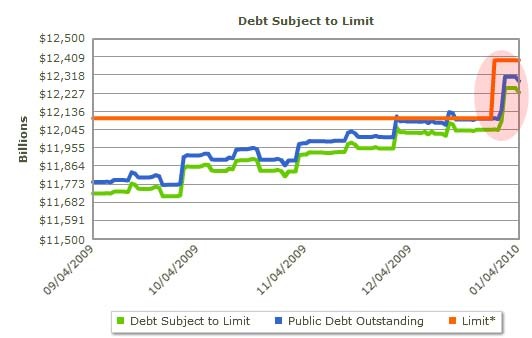 And as the chart below shows, the Treasury’s cash flow projections were spot on: 3 days later, and the debt subject to limit surged to $12,254, a jump of over $200 billion in 2 days, and a whopping $150 billion over the old debt ceiling. Three days is all the buffer the administration’s reckless spending spree has afforded this country to avoid bankruptcy. Had one more Democratic vote dissented from the stopgap measure, the US would now be in technical default. There is just $140 billion left before the revised debt ceiling is breached. We hope for the country’s sake that Bill refunding in January is massive, because as we already pointed out, on January 7th we expect another ~$130 of new Treasuries to be announced for auction by January 15th. And then there are two more weeks in January… Which is why the Treasury better be using that TARP money to pay down all it can, because if the general population understands how close this nation was to the fiscal brink, many more answers may be demanded out of the ruling party as to how it could allow things to get so out of hand.